Abuzz with visitors discovering and testing out all manner of sustainable alfresco products, Dwell Outdoor drew a huge crowd all day Saturday, with many filing in and out of a brand-new modern Airstream trailer and the eco-friendly home designed by ecofabulous founder Zem Joaquin. Standouts were the beautifully designed chicken coop, complete with real chickens, landscape architecture firm Shades of Green’s booth covered completely in real sod, and oversize pebble–like outdoor seating by Eis Design, but every one of the elements on the floor helped bring home the fact that sustainable outdoor living is striking, smart and here for good. 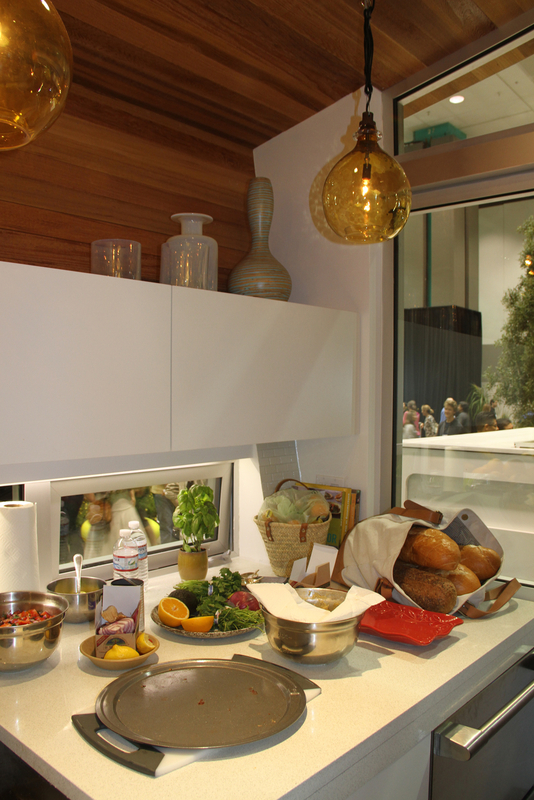 Incredible cooking aromas emanated from the kitchen inside the eco-friendly home designed by ecofabulous founder Zem Joaquin and architect Jonathan Davis of pieceHomes, and built by Australian sustainable prefab builder One Build. “One of the biggest impacts on sustainability is an energy-efficient house,” notes the architect. A line of people waiting to get inside the new Airstream trailer brought by Southwest Coaches continued all day. The interiors were worth it—modern curves, sleek finishes and plenty of headroom abounded. Evoking a xylophone stretched over a curving, anthropomorphic form, chairs from the Amalfi collection by Bocabolo offered a chic respite for many a weary show traveler. A couple hangs out on a piece by San Luis Obispo design firm Jory Brigham—who makes amazing furniture in the studio craft style—beneath a vignette of Southwest Trees with circle pots by Potted. The Dwell Outdoor trees were enlivened by blue garden spheres and hanging circle pots from L.A.-based Potted. A little one points to a chicken in a stylized plywood-and-acrylic coop by Chicken Co-Op. Complete with egg-shaped venting cutouts, the co-op has passive heating and cooling systems and a solar-powered fan to keep hens happy and naturally productive. Tile designer Daniel Ogassian, who designed a paver that invites grass to grow up through it, brought his undulating tri-form planter. Landscape architecture firm Shades of Green clad their booth completely in sod, which proved too tempting not to experience close-up. Having worked for Frank Gehry’s office, Eva Sobesky of Venice-based Eis Design says she “loves curves.” So when a client asked for outdoor furniture that was not typical, she came up with Pebbles, available in stacked wood, lightweight concrete and a cozy fabric. A delicate but durable round table in blue by Loll, which makes its furniture out of 100-percent recycled plastic. And it looks much nicer than an old water bottle. The planters, much-coveted on the show floor, are from Gainey Ceramics. The Pebble serves as a snack stop for a young, sustainably minded visitor.